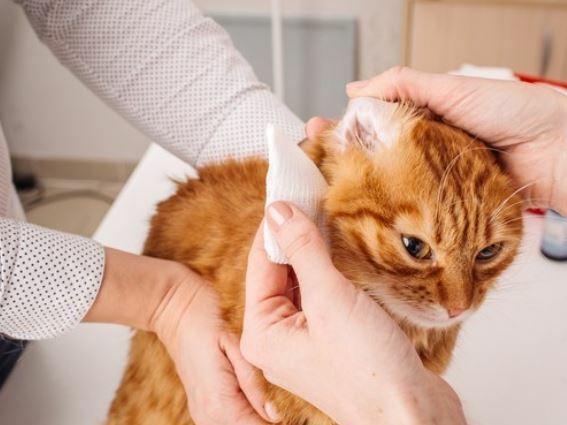 How to Clean the Cat’s Ear – Maintaining a cleansing routine prevents the accumulation of wax and, consequently, decreases the chances of developing ear diseases. As much as cats are clean animals, they can not do the hygiene of their ears. This means that this task is the responsibility of the owners and can not be overlooked. Just as we brush our hair, we take the veterinarian, we buy feed and we change the water from the water fountain, we also have to be attentive to the hygiene of the cat’s ear. The hygiene of this part of the body is very important, because the accumulation of wax can lead to the development of mites, fungi and even larvae. Lack of care can cause a severe ear infection or ear infection. Therefore, always clean the cat’s ear and avoid ignoring this task. The kitten can not associate the cleaning with something bad, so it is important that it is very calm during the act. Start by caressing, saying compliments and placing you strategically in your lap. If it is the first cleaning, have patience and do not skip steps to end soon. Before cleaning, check how dirty it is. If there is too much wax accumulated, strong odor, scabs or wounds may be that the cat is with some auricular disease. In this case, it is recommended to go to the veterinarian to evaluate the situation and indicate the appropriate treatment. However, if you do not notice any different signs and the ear looks normal, cleaning can be performed normally. Take a moistened towel and cat specific shampoo. Go wiping the outside and hairy part of the ear fairly calmly using the bath product. Use the towel to remove any residue. Make sure the ear is clean and break into the inner region. Cleaning the inside of the ear should be done with great caution. Care must be taken not to compromise the auditory structures. So a sterile cotton gauze is enough. Wrap the finger gauze and gently insert it into your ear. Rotate in a gentle motion for the wax to attach to the cotton and remove from inside the ear. Another cleaning option is to use cat specific ear cleansers. They are found in pet shops and comes with a self applicator. Its function is to dilute the ear wax and leave no accumulated secretion.